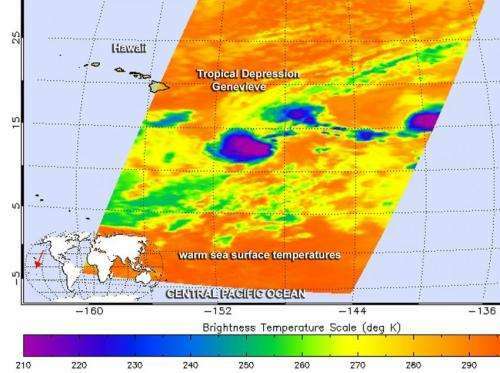 Infrared imagery from NASA's Aqua satellite helped confirm that the remnant low pressure area of former Tropical Storm Genevieve has become a Zombie storm, and has been reborn as a tropical depression on July 30. Tropical Storm Genevieve weakened to a tropical depression on Sunday, July 27 and the National Hurricane Center issued their final advisory on the system as it was entering the Central Pacific. Now, after three days of living as a remnant low pressure area, Genevieve reorganized and was classified as a tropical depression again. The Tropical Rainfall Measuring Mission or TRMM satellite measured rainfall rates in the newly reborn Tropical Depression Genevieve on July 30 at 0523 UTC (1:23 a.m. EDT). A rainfall analysis from TRMM's Microwave and Precipitation Radar instruments shows rain falling at a rate of over 28.5 mm/hr (about 1.1 inches) near Genevieve's center. TRMM is a satellite managed by NASA and the Japanese Space Agency. When NASA's Aqua satellite passed over Genevieve on July 30 at 11:29 UTC (7:29 a.m. EDT), the Atmospheric Infrared Sounder (AIRS) instrument gathered infrared data on the storm's cloud tops. AIRS data showed thunderstorms reaching toward the top of the troposphere had redeveloped around the low pressure area's center of circulation. Cloud top temperatures exceeded -63F/52C and had the potential to generate heavy rainfall. At 5 a.m. HST (11 a.m. EDT/1500 UTC) the center of Tropical Depression Genevieve was located near latitude 12.9 north, longitude 149.6 west. That puts Genevieve's center about 585 miles (940 km) southeast of South Point, Hawaii and 795 miles (1,285 km) southeast of Honolulu. Genevieve is moving westward at about 10 mph. The depression is moving toward the west near 7 mph (11 kph) and this motion is expected to continue through the next two days. The estimated minimum central pressure is 1009 millibars. According to NOAA's Central Pacific Hurricane Center (CPHC), Genevieve's maximum sustained winds were near 35 mph (55 kph) and some strengthening is forecast during the next two days, with Genevieve likely becoming a tropical storm within the next day. There are no coastal watches or warnings in effect. To the west of Genevieve, there are two other developing tropical low pressure areas, but they have low chances for development. The first is a disorganized area of showers and thunderstorms about 810 miles south-southwest of Oahu. The CPHC expects this low pressure area to drift slowly to the west-northwest and forecasters there gave it a 20 percent chance of becoming a tropical depression over the next two days. 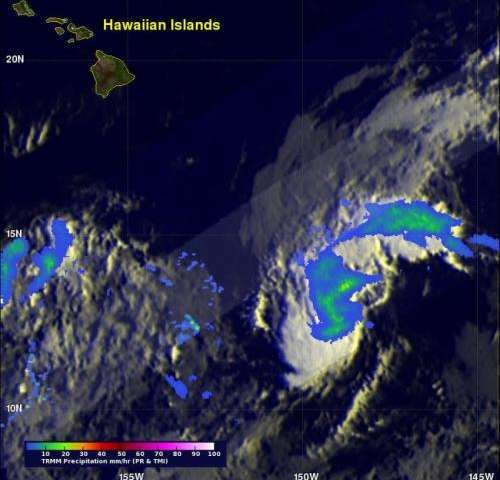 The other area is one of disorganized convection (rising air that forms thunderstorms), clouds and showers was centered about 1,600 miles southwest of Oahu. The CPHC noted that there is little, if any, indication that any organization is possible with this system during the next couple of days. So, even if those two low pressure areas remain "dead" to development, Genevieve the zombie storm is expected to strengthen into a tropical storm in a day or two.